"Virtual reality will change how we look at a patient's anatomy during an IR treatment," said Wayne Monsky, MD, PhD, a professor of radiology at the University of Washington and lead author of the study. "This technology will allow physicians to travel inside a patient's body instead of relying solely on 2D, black and white images." The purpose of the study is to demonstrate the feasibility of using a catheter with electromagnetic sensors projected onto a VR headset to see and steer the catheter through the anatomy to certain blood vessels.Using a CT angiography scan, researchers created a 3D printed model and a holographic image of blood vessels in a patient's abdomen and pelvis. Monksy's team of radiologists guided hi-tech catheters through the 3D printed model while the tracking system showed the image from the catheter through the VR headset. They compared the time taken to steer the catheter from the entry point of the femoral artery to three different targeted vessels versus the time the process took using conventional fluoroscopic guidance, as well as time taken in similar real-life clinical angiographic procedures. 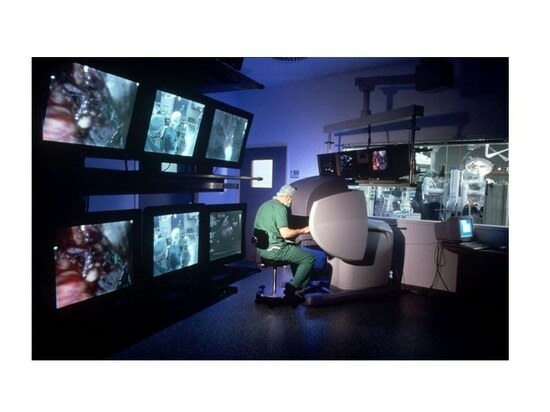 "Currently, the life-saving potential of IR is limited to hospitals and areas with the resources to invest in image-guided technology," said Monsky. "There are 3 billion people worldwide in rural areas who don't have this access. This technology could allow for portability and accessibility so that these procedures are brought to rural areas using nothing more than a suitcase."